A new, state-of-the-art instrument installed in the Radiation Laboratory will support a wide range of research at the University of Notre Dame. 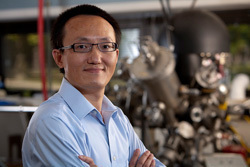 The AP-XPS (ambient pressure X-ray photoelectron spectrometer) was designed by Franklin Tao, assistant professor of chemistry and biochemistry, in collaboration with the manufacturer. The project brought together faculty in the departments of physics and chemistry in a collaboration that included the Notre Dame Radiation Laboratory, the Department of Energy, the Office of the Vice President for Research and the College of Science. Creation of the system would not have been possible without such collaboration. The instrument uses monochromated Al Kα instead of synchrotron radiation as an X-ray source. It is the first high-pressure reaction-cell type in-house AP-XPS to be built. It is uniquely capable of studying surfaces and interfaces of materials under reaction conditions and in different reactive environments up to tens of torr (1 atm = 760 Torr). Tao’s research focuses on nanocatalysts for energy applications, such as fuel cell design and the production and purification of hydrogen. He will use the AP-XPS to study nanocatalysts under actual reaction conditions (operando studies). This will allow Tao to build an intrinsic correlation between the surface chemistry of the catalysts and their catalytic activity. This information will permit a greater understanding of catalytic mechanisms and will inform the design of new catalytic materials. 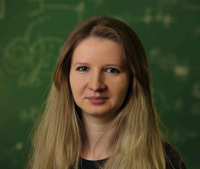 Sylwia Ptasinska, the first faculty member at Notre Dame with a joint appointment in physics and the Radiation Lab, will use the instrument to study chemical changes in biomolecules such as proteins or DNA when they are irradiated. The AP-XPS will allow her to introduce water into the system to observe its effects during the radiation, rather than observing the DNA alone. This will ensure that the experiment is more like the actual experience of DNA in the human body when exposed to radiation in a doctor’s office or airport scan. Originally published by Marissa Gebhard at newsinfo.nd.edu on December 08, 2011.